Countdowns to Christmas are everywhere. You can’t log on to any social media channel at this time of year without seeing a countdown to Christmas. And while those annoying reminders occasionally make me wonder why I’m friends with some people, they also drive home the realization that Christmas is fast approaching — meaning presents, decorations, meals, and celebrations need to be organized. And if I’m stressed about that, imagine how Santa feels in the lead-up to Christmas. At TPM, we know Cloud, and we see how it benefits our clients and their customers, not to mention the countless other businesses who rely on Cloud technology. And we’ve been thinking: if everyone from SMBs to multinational corporations can benefit from the Cloud, why can’t a man who has arguably one of the toughest logistical gigs on the planet? With that in mind, we bring you our Why Santa is Moving to the Cloud infographic — happy holidays! It’s a well-known fact that every year, on the day after Christmas, Santa Claus gets a cup of hot chocolate and lowers his exhausted body into his recliner in front of the fireplace. Soon, he closes his eyes, but he can’t sleep. He remembers the time when the elves misplaced Tommy’s Christmas list, or when they forgot to watch Samantha’s Facebook page to monitor what she’d been up to. He recalls the incident where some bad kids followed Jerome home from school because a delivery list that had his address and personal information fell out of the sleigh while it was flying over his neighborhood. Santa is 1,746 years old and knows a few things about running a manufacturing and logistical enterprise. He’s done well over the years, but his client base — kids around the world — continues to increase. The elves are maxed out, things are falling through the cracks, more privacy protection is needed, and costs that have jumped astronomically need to be brought back to Earth. Santa needs a more efficient, reliable way to keep track of what all the kids want, whose behavior has been only so-so, and updated addresses. And he needs to get his elves back on track with toy making instead of dealing with software maintenance and upgrades. He bolts upright in his recliner. Santa knows what he’s going to do. 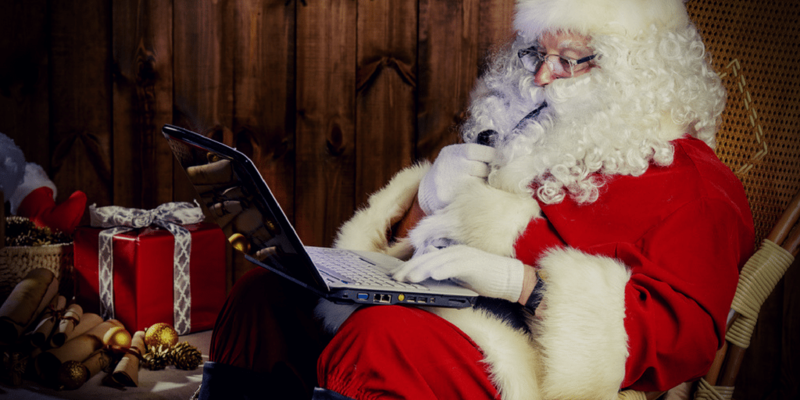 Santa’s moving to the Cloud this year! Our Why Santa is Moving to the Cloud infographic shows how massive an operation Santa runs at the North Pole and outlines the varied benefits the apps in the Cloud will give him. If you’d like to share our Why Santa is Moving to the Cloud infographic on your blog or website, simply copy and paste the code below. Happy holidays from all of us at TPM!